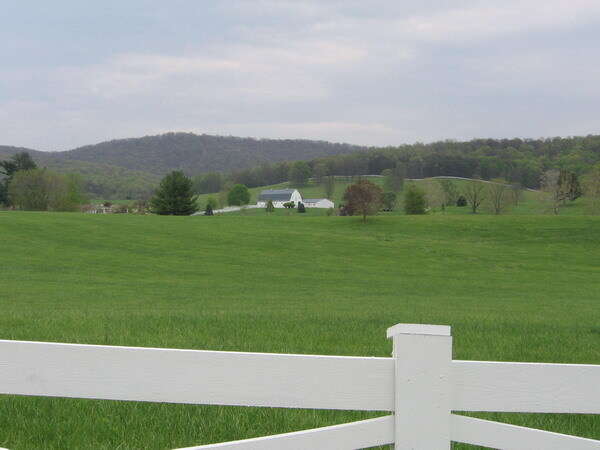 Virginia Groundwater has conducted more than 100 electrical resistivity geophysical surveys in central Virginia in recent years, and we have drilled many wells on the basis of what the surveys indicate. We have learned that different geologic formations and soil types produce distinctive signatures in their respective ER profiles. As we become more familiar with these signatures, we are better able to judge water-bearing capabilities, and manage well construction. The following gallery includes images representative of ER surveys we have conducted across major geologic formations in central Virginia. 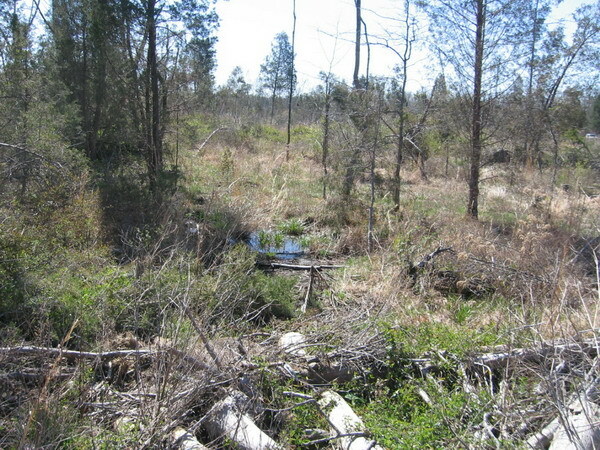 These examples illustrate the challenges of locating a favorable drilling site, and constructing a successful water well in an area as geologically complex as central Virginia. Granite bedrock produces thick soils that are good for farming, and good for groundwater recharge. Groundwater prospects are generally favorable, but dry holes or low-yield wells do occur where drilling sites are randomly selected. Soils derived from granite bedrock make great farm land. The 1993 Geologic Map of Virginia shows granite gneiss bedrock in the core of the Blue Ridge anticlinorium as violet color. The ER image shows a favorable drilling target (blue tones) near the center, which resulted in construction of a 45 GPM well. Note that the prospects are much less favorable on either side of the image. Diabase is a hard igneous rock that produces soils which do not transmit water very readily. As a result, diabase country commonly contains a lot of standing water at the surface, and soils that are difficult to farm or use as construction substrate. 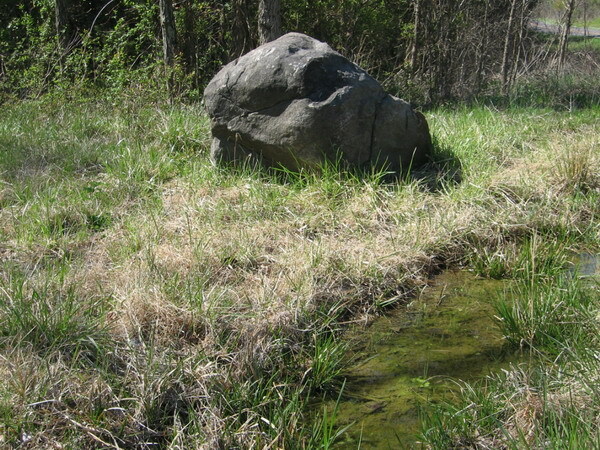 diabase boulder amid standing water. BlackJack soils formed from diabase bedrock do not allow water to pass easily. 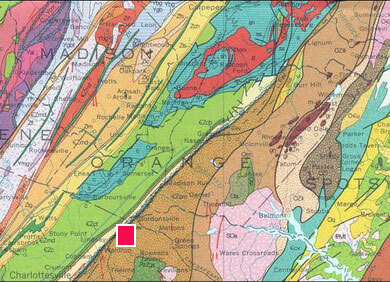 Diabase bedrock in red on the 1993 Geologic Map of Virginia. Groundwater recharge is also compromised because the water that falls on the ground during rainfall events stays there, rather than percolating downward to recharge bedrock fractures. Water-bearing fractures that have viable recharge rates are difficult to find in this type of rock. The ER profile below shows a lot of water at the surface, but none in the underlying bedrock. There are no viable drilling prospects on this image. Geophysical image in diabase bedrock: water (blue) occurs at or near the surface, but the rock below is devoid of water-bearing fractures. Metamorphosed volcanic rocks in the central Virginia Piedmont tend to have favorable fracture networks, and associated soils that are good providers of groundwater recharge. Metamorphosed volcanic rocks are blue-green on the 1993 Geologic Map of Virginia. The ER image shows multiple water-bearing zones (blue) that are associated with vertical or steeply-dipping discontinuities. These discontinuities are interpreted as steeply dipping fracture zones in the bedrock. The drilling target that was selected yielded 100 GPM. Multiple water-bearing zones (blue) mean multiple drilling possibilities on this geophysical image in metamorphosed volcanic rocks. There is a wide belt of phyllite bedrock that extends across central Virginia through eastern Albemarle and western Louisa counties. This is a very soft rock that does not have the ability to hold open fractures under the confining pressures that exist beneath the surface. As a result, groundwater is scarce, and successful wells are difficult to construct. 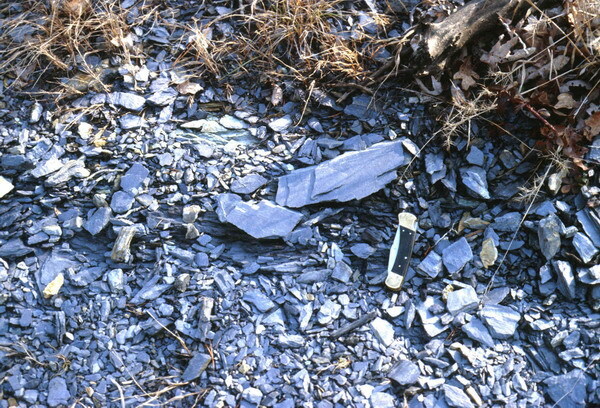 Phyllite is a soft, gray or purple rock that is not rigid enough to hold open bedrock fractures below the surface that could serve as conduits for groundwater. Phyllite bedrock occupies a large area colored brown on the 1993 Geologic Map of Virginia. The soils that overly this type of bedrock are not good for farming. As a result much of this land has remained wooded. 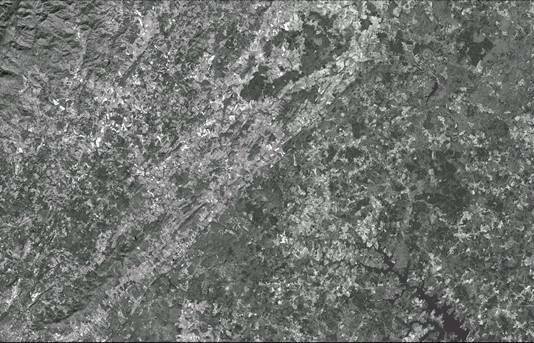 Note the correlation between the geologic map pattern, and the distribution of forest land on the satellite image. Compare the pattern of farm land (light gray tones) and forested land (dark gray tones) on the aerial image versus the geologic map of the same area, above. The ER image from phyllite terrain shows several discrete water-bearing zones (blue). The problem is that almost all of these are above the inferred top of solid bedrock. In this type of geology, it is not uncommon the operator of an air-rotary rig to have to set 80 or more feet of casing in order to construct a well that won’t collapse. Setting that much casing would cut off the relatively shallow water zones in this image. In this type of rock, we recommend drilling with a cable-tool rig rather than a conventional air-rotary rig. The cable-tool operator may be able to construct a stable well using less casing, and take advantage of relatively shallow water. Geophysical image in phyllite bedrock shows water in the saprolite, above bedrock, but no water in the rock itself.